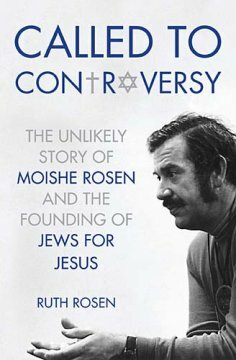 I just finished reading Ruth Rosen’s Called to Controvesy: The Unlikely Story of Moishe Rosen and the Founding of Jews for Jesus (Thomas Nelson, 2012). It was a fascinating read which I found difficult to put down. In fact, I stayed up late last night, and woke up early this morning, to finish it. The book tells the story of Moishe Rosen, the founder of the evangelistic ministry Jews for Jesus, from the vantage point of Moishe’s daughter Ruth. One of the things that struck me was how honest Ruth was concerning her father’s shortcomings and flaws. (At times, in fact, I wondered if she could have spent more time dwelling upon his gifts and virtues!) Moishe emerges from the pages of the book as an imperfect and often controversial man, but also a sincere and compelling figure, a man clearly called and used of God. He reminds me of other “larger than life” Christian leaders who approach a certain kind of ministry (in this case, Jewish evangelism) in a completely new way, and as a result both step on toes as well as blaze a trail for others to follow in. It seems from the book that Moishe did not have a dynamic personality, and that he did not start off ministry with lots of resources or what the world might see as great leadership potential. But God used him greatly. I think his great gift was his ability to connect with people in order to present Christ to them. He showed a genuine interest in people, had an intuitive sense of how to read them and engage with them, as great evangelists often do. Also, his driving passion for sharing the gospel made him willing to use unconventional methods where others would not. Throughout his ministry, he acquired a lot of practical wisdom about how evangelism works. He once said, “when you present the gospel, the thing that keeps most people from the Lord, even when they are interested, is the belief that it is not possible for them to receive Jesus-if they’ll articulate that, the answer is always the same-God empowers us, don’t you think God can handle that?” (156). I think that’s a great insight. When I was in high school, my Dad pastored a church in Augusta, Georgia, and he would often invite fairly well-known Christian pastors and scholars to come to the church to preach or speak at a conference. Usually my parents would take them out for a meal afterwards, and I would get to go tag along, and so I got to meet and interact with people like Sinclair Ferguson and D.A. Carson and John Piper and many others, which was fascinating. Of all the people that I got to meet in this way, however, no one made more of an impression on me than Moishe Rosen, who came with David Brickner (Executive Director of Jews for Jesus) to speak at our church when I was a senior in high school. Usually on these occasions I just listened in on the conversation for the most part, but not so when Moishe came. He asked me questions and made me feel like he was genuinely interested in me and what I had to say. Somehow a study I recently had conducted on cessationism came up (I think my mom mentioned it), and he pressed me about my views. I remember being struck by both Moishe and David’s kindness, and their sincerity. I felt like they were the kind of people who were easy to become friends with. Toward the end of the conversation, Moishe looked straight at me and said, “Gavin, you’re a winner.” I never forgot those words. They meant a great deal to me in college, during times of personal doubt. And I will never forget Moishe Rosen, and the legacy he left for evangelism and for ministry to the Jewish people. I look forward to getting to know him better in heaven. Gavin, it’s always nice to read an articulate, positive review of Called to Controversy, but I’m especially glad you shared your memory of that lunch. I can just picture it. I think I met your dad once when we were kids and my family had lunch at your dad’s house, well really your grandfather and grandmother’s house. My dad thought very highly of Ray Ortlund Sn and then later, of your dad too. I hadn’t realized that his friendship extended through three generations of Ortlunds, which is very cool. Not surprising on the whole, but a nice surprise for me to read about today. Thanks! Thanks for the comment, Ruth! Your Dad was a very special man. I am sure you miss him very much. I really enjoyed your book, and am so glad I could read it. Thanks, and blessings to you! What a great man he was. Thanks, Gavin.